For the Australian politician, see Murray Hamilton (politician). 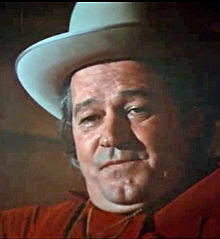 Murray Hamilton (March 24, 1923 – September 1, 1986) was an American stage, screen, and television character actor who appeared in such films as Anatomy of a Murder, The Hustler, The Graduate, The Amityville Horror and Jaws. Born in Washington, North Carolina, Hamilton displayed an early interest in performing during his days at Washington High School just before America's entry into World War II. Bad hearing kept him from enlisting, so he moved to New York City as a 19-year-old to find a career on stage. In an early role, he performed on stage with Henry Fonda in the classic wartime story Mister Roberts as a replacement, playing Ensign Pulver. In 1950, he was onstage again with Fonda in Critic's Choice; Howard Taubman of The New York Times called him "properly obnoxious as the director". Hamilton was teamed once more with Fonda in 1968 for the drama film The Boston Strangler. His best known performance is as Larry Vaughn, the obdurate mayor of Amity, in the Steven Spielberg thriller Jaws (1975). Hamilton reprised the role in the sequel, Jaws 2 in 1978. He was approached to reprise his role in Jaws: The Revenge, but died in 1986 aged 63 . Other notable big-screen appearances include the critically acclaimed 1959 film Anatomy of a Murder with James Stewart, in which he played the bartender Al Pacquette, who gives testimony in the murder of Barney Quill. He worked again with Stewart in The Spirit of St. Louis (1957) and The FBI Story (1959). The actor made dozens of TV guest appearances. In 1955, Hamilton guest-starred on the NBC legal drama Justice, based on case files of the Legal Aid Society of New York. Hamilton appeared in the Perry Mason episode "The Case of the Deadly Double" (air date March 1, 1958) as the shadowy boyfriend of a woman with a split personality whose brother is Mason's client. In 1959, he appeared in a few episodes of the crime drama The Untouchables, as well as co-starring in the second episode of Rod Serling's television series The Twilight Zone, "One for the Angels", playing Mr. Death opposite Ed Wynn. Also, Hamilton portrayed Calhoun, on (S4E9) of Gunsmoke, which aired in April, 1959. His character is swindled in a land deal along with other members of a wagon train & his wife tries to leave Calhoun with the swindler. In the 1959-60 television season, Hamilton also co-starred with William Demarest, Jeanne Bal, and Stubby Kaye in the NBC sitcom Love and Marriage. He played attorney Steve Baker, who resides in an apartment with his wife (played by Bal), two daughters and a father-in-law (portrayed by Demarest). He soon appeared as a guest star on another sitcom, The Real McCoys, starring Walter Brennan, on ABC. In 1961, he appeared in another science fiction series, Way Out, hosted by Roald Dahl, with fellow guest stars Doris Roberts and Martin Huston. In 1986, he played Curtis "Big Daddy" Hollingsworth, Blanche Devereaux's father, in a first-season episode of The Golden Girls. Hamilton complained in a newspaper article about being typecast, stating "After I was first cast as a heavy on The Untouchables, I couldn't ever persuade them [producers] that I could also do something else." While comic roles were rare for Hamilton during his Hollywood career, he had one opposite Andy Griffith in the 1958 military comedy No Time for Sergeants, as well as an appearance in Steven Spielberg's raucous comedy, 1941 released in 1979. He also appeared in a comedic guest spot on Mama's Family in the second-season episode, "Mama Cries Uncle", as Uncle Roy. He was more often cast in dramatic works, such as the stark science-fiction drama Seconds (1966), which starred Rock Hudson. In two of his most distinctive performances, Hamilton appeared with Paul Newman in The Hustler (1961), playing Findley, a wealthy billiards player who gambles for high stakes, and in The Graduate (1967) as Mr. Robinson, husband of the seductress Mrs. Robinson. In 1975, Hamilton appeared again with Newman in The Drowning Pool. He also worked with Robert Redford in a pair of films, The Way We Were (1973) and Brubaker (1980). For many years both before and during his film career, Hamilton was a prominent dramatic stage actor, earning a Tony Award nomination for his role in the 1965 production of Absence of a Cello. New York Times theater critic Brooks Atkinson praised his work in the play Stockade, which was based on a part of the James Jones novel From Here to Eternity: "Murray Hamilton is an ideal Prewitt. Modest in manner, pleasant of voice, he has a steel-like spirit that brings Prewitt honestly to life." When the actor was suffering from cancer and found film roles harder to come by, his old co-star George C. Scott helped out by getting him a part in the made-for-television movie The Last Days of Patton (1986). Hamilton died of lung cancer at age 63, and is interred at Oakdale Cemetery in his native Washington, North Carolina. He and his wife, Terri DeMarco Hamilton (of The DeMarco Sisters fame), had a son, David. ^ a b c d "Murray Hamilton, a Character Actor for Over 40 Years". The New York Times. September 17, 1986. ^ a b c d e "Murray Hamilton dies". Santa Cruz Sentinel. Associated Press. September 19, 1986 – via Newspapers.com. ^ "Murray Hamilton About This Person". The New York Times. The New York Times Company. 2010. Retrieved 18 July 2018. ^ Bryan, Jacob (20 June 2017). "'Jaws' 42nd Anniversary: Cast then and Now". MSN Movies. Archived from the original on 5 August 2017. Retrieved 6 June 2018. ^ Jankiewicz, Patrick (9 June 2013). Just When You Thought It Was Safe: A Jaws Companion. BearManor Media. p. 254. ^ Tucker, Kenneth (20 December 2011). Eliot Ness and the Untouchables: The Historical Reality and the Film and Television Depictions (2nd ed.). McFarland Publishing. p. 111. ISBN 9780786488773. ^ Rubin, Steve (1 September 2017). "Syfy September 1 in Twilight Zone History: Remembering actor Murray ('One for the Angels')". SyFy. Retrieved 18 July 2018. ^ Lowry, Cynthia (January 10, 1963). "Murray Hamilton Breaks the Mold". The Newport Daily News. Retrieved 18 July 2018 – via Newspapers.com. ^ "Murray Hamilton, 63, Veteran Actor of Film and Television, Dies". LA Times. 3 September 1986. Retrieved 12 August 2018.